Today, Aiken Promotions are delighted to announce a headline show for Petal, Upstairs at Whelan’s. 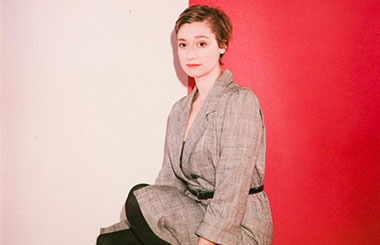 Petal aka Petal’s Kiley Lotz examines on Magic Gone, the band’s latest full-length album on Run For Cover. Recorded over the course of a month at Studio 4 in Conshohocken, PA, Magic Gone is a bitingly honest look at adulthood, accountability, responsibility, and mental health and the difficulties that go along with each of them. “I was a closeted queer person struggling with chronic mental health disorders,” says Lotz of the three year period that inspired the album. That’s not to say that the last few years have only been negative for Lotz – there were a lot of great moments, too. She moved from New York City to Philadelphia, changed her focus from acting and theatre to music, toured with Julien Baker, Slingshot Dakota, and Kevin Devine, and chose to come out and live openly as queer, which she looks back on as one of the most beneficial decisions she’s ever made. “Coming out was the beginning of a long and continuing process of self-actualization, of taking a hard look at myself and the problems I had and how I could fix them,” says Lotz. Still, the highs of her rapidly changing life weren’t able to outweigh the lows, and in early 2017, Lotz found herself hitting a breaking point. Her mental health was rapidly declining, and after a relapse of suicidality, she made the difficult decision to prioritize her health above all else and move back to her hometown to enter intensive treatment for her major depressive and panic disorders. The culmination of it all is an album that showcases Lotz’ prowess as both a vocalist and a songwriter, drawing equal influence from ‘70s powerhouses like Queen and Nina Simone as it does modern vocalists like Solange, Margaret Glaspy and Mitski. Producer Will Yip distills Lotz down to her purest form, lending an unprecedented rawness to her sound. Themes of duality even make their way into the album’s instrumentation, specifically in Lotz’ decision to include church organ on the album; playing organ was a huge part of her life growing up, and to this day the sound of it inspires both comfort and fear in her. Track by track, the singer transforms her vulnerability from a curse into a tool with which to examine both where she went wrong and where she went right in her struggle for survival. Lotz offers a lesson for each of us on having the courage to face our demons and make the best choices for ourselves.